Hey guys, thanks again for all your support, advice, pledges and help with our crowd funding campaign so far! 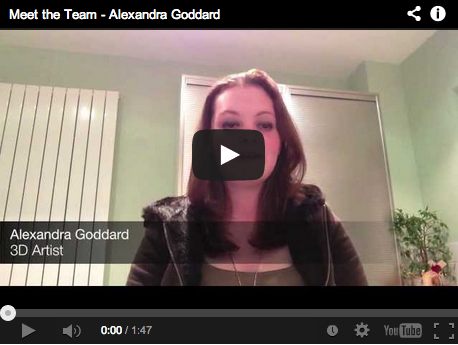 In this update, meet Alexandra Goddard, an awesome up and coming 3D design and animation guru. She's been working on some amazing game designs for the game template packs. Each pack will feature her wonderful hand made designs, art asset, animations, and of course accompanyingsource code, all royalty free for use to publish as your own games. Hey guys, thanks so much for all your support, advice, pledges and help with our crowd funding campaign so far! On Tuesday, I was at the PS4 Developer's day here in London, and man that piece of kit looks impressive! I talked to a few of the PS4 guys including their VP of R&D, and they all seemed really excited by the idea of creating games in real-time. Follow @TheSakeDiary, who is a presenting super-hero and game dev guru. @spadgy_OTA for ace tips and encouragement on how to connect with the Press. @pete0151 for honest and entertaining tips on partnering with Sony. On the tech front, I wanted to share with you some of our experiments with the technology. One of our biggest ambitions is to be able to live motion capture yourself into a 3D character which can be played in a 3D multiplayer game. In this video, we show the editor reading in RGB + depth camera input and converting it live into a 3D mesh. The tech is really early at the moment, needs more filtering, but I hope you can see the potential. Next week (16th October), we'll be at Robert Gordon University in Aberdeen, giving a talk on how the architecture works along with live demos. So if you're around get in touch and I'll send you the final times. 25th we'll be at MozFest, giving free demos and education to anyone we can grab. 7th November, we'll be at the University of Birmingham, dropping free education too. We're also hopefully setting up a talk at a 3D design college here in London, to show students how they could easily get their artwork into a live game to help boost their portfolios when applying for jobs. If you'd like a presentation/talk at your school/uni/event feel free to get in touch, we're more than happy to arrange something. We're not the best marketeers in the world, so if you know anyone who would be interested in the tools and technology we're building, please let them know. If you know any press who might think this tech is cool, please let them know too. Finally, my good friend and Unity genius @ynknl, was telling me that the more comments a project gets the more likely it is to be noticed. So drop in some comments on what you'd like to do with this tech? What game would you make? Hi guys, we just launched a crowd funding campaign offering great rewards at discounted prices. Ranging from game pack rewards featuring royalty-free access to source code, 3D models, animations and sounds and server-side multiplayer hosting to build your own 3D multiplayer games from. All the way to game producer rewards where we'll build a game to your specifications and help you publish it on all the app stores. Please check out our campaign and help us turn our dream of opening up these closed platforms into a reality. Playir.com is now live with much more of a breakdown on our features and events, so be sure to take a look around, and feedback is always welcomed. I also was recently interviewed by Experimentation Online, where I gave a bit more background on how we're trying to change things, so check that out too.